Start your Macau tour from Maritime Museum (海事博物館; 1 Largo do Pagode da Barra; www.museumaritimo.gov.mo; 10:00-18:00, closed on Tuesdays; MOP$5) located on the southwest of Macau Peninsula. The three-storey museum was officially opened in 1987, but since the building at the time wasn’t spacious enough, the new one was launched in 1990. As the name itself says, it is the museum where you can enjoy the exhibition of ships and maritime industry in general. It provides deep insight into the history of Macau, presenting both – Chinese and Portuguese nautical vessels since it is built on the place where Portuguese explorers first landed. Opposite Macau Maritime Museum is A-Ma Temple (媽閣廟). This is one of the oldest temples in this area, built in 1488, and one of the Buddha halls in Macau. It commemorates Mazu, the sacred sea goddess, and the temple offers a peaceful and serene view. Typical Chinese architecture, with all of its colors, curves and details will provide you with the real experience of Chinese culture and tradition. Constructed mostly of bricks and stone, it contains six parts, with stone lions guarding it. A huge statue of Mazu, poems carved on the stone and the hall, which is considered to be the oldest in the complex, can be regarded as the main features of this simple, yet very important temple. From A-Ma Temple, head northwest, and after 25 m turn right on Calcada da Barra. Stay on Calcada de Barra and after 220 m on your right side, you will see Moorish Barracks (港务局大楼; Calcada da Barra). The fact you cannot enter the barracks and experience it from the inside is a disappointment, but the things it offers on the outside are also nice to see. It dates from colonial times, more precisely from 1874, and its unusual architecture has something neo-classical, but yet it is obvious that so many different cultures mix and create something new here. This is the only building in Macau that has features of both, Gothic and Arabian style and the long porch is probably the most interesting part of the building. Further on, 280 m up the Calcada de Barra, the street goes to Lilau Square, the first Portuguese residential quarters where the Mandarin’s House stands firm in all its colors across the street. Mandarin’s house (郑家大屋; 10 Travessa de Antonio da Silva; 10:00-18:00, closed on Wednesdays; free), the traditional Chinese residential complex is not very rich in its architecture, again giving the insight of Macao’s multicultural background and heritage. Dating from 1869, the former home of Zheng Guangying is a great example of how Chinese and Western cultures interchange at one place. However, its humanistic value should also not be neglected, regarding the fact that the best book of its owner of its owner, Word of Warning in Times of Prosperity, was written in this house. Further on from Mandarin’s house, 300 m up the road, St. Lawrence’s Church (聖老楞佐堂; Igreja de São Lourenço) stands on the left side of Rua de São Lourenco (São Lourenco Street). The church is very old, constructed in 1560, yet also nice regarding its beautiful garden and surroundings. However, the look it has today was not acquired before 1846, since at first it was mainly a wooden church. It is built in neo-classical style, painted in cream and white, with a greatly decorated interior. Overlooking the sea, it was an important gathering spot for sailor’s families to pray for the well-being of their loved ones while on the sea. Behind the St. Lawrence’s Church, just across the junction Rua da Prata and Rua de São José, is St. Joseph’s Seminary and Church (聖若瑟修院及聖堂; Igreja e Seminário de São José). St. Joseph’s Church, built in 1758 is the rare example of baroque architecture in China, and that makes it so different from other religious objects in this country. However, you can notice the presence of neo-classical style in the Seminary, established in 1728, mainly constructed of gray bricks, which makes it opposite from the church. This place is important because it keeps St. Francis Xavier’s arm bones, considered to be one of the precious sanctities. After visiting the church, walk back on Rua da Prata toward the St. Lawrence’s Church, then turn left onto Rua da Imprensa Nacional. Follow Rua Central and Calcada do Teatro for 300 m and you will be at St. Augustine’s Square surrounded by a group of monuments – Dom Pedro V Theatre (Teatro Dom Pedro V), Sir Robert Ho Tung Library (Biblioteca Sir Robert Ho Tung) and St. Augustine’s Church (Igreja de São Agostinho). Dom Pedro V Theatre (伯多祿五世劇院; 10:00-18:00, closed on Tuesdays) can be compared to some of the famous European theaters of the time with its Western-style, yet it remains very typical and perfectly fits the Chinese environment of Macau. Built in 1860, it was of a huge importance for that period, since it was the main place for public events and community gatherings. Interior and architecture design, in general, are unique, giving the special impression with a quiet atmosphere. Sir Robert Ho Tung Library (何東圖書館; 10:00-19:00) is a very important public library in Macau, taking in consideration its architectural, historical and cultural value. Originally, it was the residence of Dona Carolina Cunha, dating from 1894. The three-storey building and its interior almost completely portray traditional Chinese architecture, with the small relaxing garden at the back. It got its name from a local businessman, who bought it and used it as his own private residence, until his death in 1955, when it officially became a public library. Located in the calm part of St. Augustine’s Square, St. Augustine’s Church (聖奧斯定教堂), built by Italian catholic Augustine priests in 1586 is one of the oldest and one of the spacious churches in Macau. Like many other building, it also represents a mix of Oriental and Western cultures, with marble altar and Doric columns, enriched with the yellow color of the nave. When finished enjoying the beauties of the church, head northeast on Calcada do Tronco Velho and after 250 m, you will arrive at main city square Senado Square (議事亭前地) and main City Avenue Avenida de Almeida Ribeiro (亞美打利庇盧大馬路), also known as San Ma Lo (新馬路). The avenue of Avenida de Almeida Ribeiro divides the old and the new part of Macau, and it is one of the places where crowds can be enormous, so for the full enjoyment, it is the best to visit it early in the morning. There are some Chinese-Portuguese buildings along the way, together with some interesting shops, and it takes around ten minutes to pass the avenue. Senado Square offers some nice streets to walk through, but basically, beyond them and several different shops and restaurants, there is not much to be seen here, and it is definitely not worth spending a lot of time. It is enclosed by old colonial buildings such as Leal Senado Building (Edifício do Leal Senado), Macao Government Tourist Office, Holy House of Mercy (Santa Casa da Misericórdia) and General Post Office Building. Hidden in a street between Macao Government Tourist Office and shops, 50 m from Senado Square, is Sam Kai Vui Kun Temple. During Macau’s time as a Portuguese colony, Leal Senado Building (民政總署大樓; 9:00-21:00, closed on Mondays; free), built in 1784, was a seat of government. It is located at the end of Senado Square, and watched from the outside, it looks like any other government building. However, with the nice courtyard at the back, and the tiles, which represent the development of Macau, this place offers a huge history blast. One more place of cultural and historical significance in Senado Square is Holy House of Mercy (or Santa Casa da Misericórdia; 仁慈堂大樓; 10:00-13:00 & 14:30-17:30, closed on Mondays; MOP$5), dating from 1569. It was used for many different things throughout the history; today a museum, originally built as an orphanage, and it also served as a medical clinic. For lovers of art and religion, it has to offer many things, usually some religious artifacts, porcelain, and other items of historical importance. Sam Kai Vui Kun Temple (三街會館; 8:00-18:00), a single room temple established in 1750, is a perfect portrayal of Chinese tradition. With modest structure and a gray brick facade, it usually served as the meeting place for Chinese merchants, since its perfect location was suitable for a commercial center. Considering the fact that after visiting the above-mentioned places, you can leave Senado Square, without the fear you missed something, follow the promenade from it, between Macao Government Tourist Office and Holy House of Mercy. After 120 meters, you will arrive in front of St. Dominic’s Church (Igreja de São Domingos). Looked from the outside, the late 16th century St. Dominic’s Church (聖多明我堂; Igreja de São Domingos), has nothing special to offer, except the interesting contrast between the yellow facade and green windows. However, grand interior, with lots of interesting statues and religious artifacts are definitely something worth checking out. It is one of those peaceful places where you just want to sit and enjoy the serenity. When finally deciding to leave the church, go along a small street (Rua de São Domingos), then turn right twice onto Travessa da Se. Walk 50 m and on the left side, you will see Lou Kau Mansion (Casa de Lou Kau). Lou Kau Mansion (盧家大屋; 10:00-18:00, closed on Mondays; free), built around 1889 was a private mansion that belonged to a merchant known as Lou Kau. The interior is the perfect place to see the traditional Macau style, with wood designs and carvings, while the gray bricks are one more portrayal of the cultural interchange of this city. From Lou Kau Mansion, head north along Travessa da Se, Rua da Palha and Rua da Sao Pãolo. Rua da Sao Pãolo (St. Paul’s Road) is a bustling historic street that will lead you to the Ruins of St. Paul’s. It is filled with many shops, including Chinese restaurants, souvenirs, clothing and handcraft shops. At the end of Rua da Sao Pãolo follow wide steps that will lead you to the Ruins of St. Paul’s, at the top of the stairs. 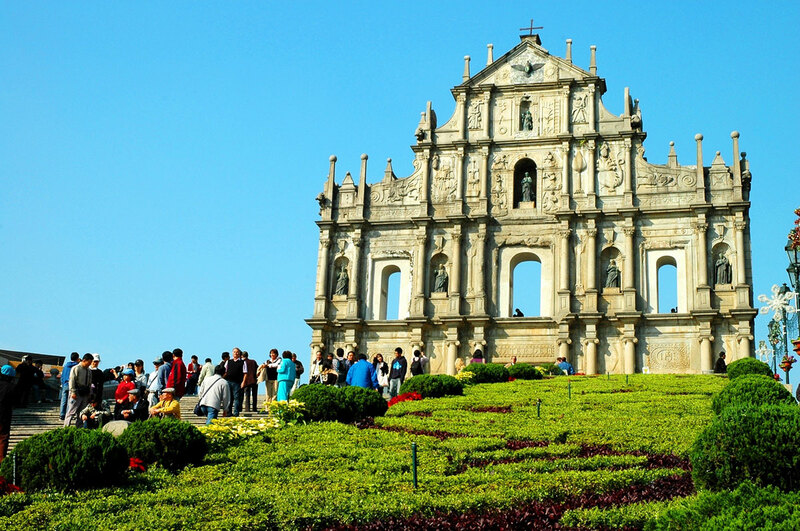 The most famous landmark of Macau are Ruins of St. Paul’s (大三巴牌坊), remains of a religious complex build between 1602 and 1640. It is located in a place where originally were St. Paul’s College and the Cathedral of St. Paul, also known as Mater Dei. Though reconstructed several times throughout the history, after the final fire that hit the complex in 1835, this place remained in ruins. Even so, it is a huge attraction for tourists. It offers many interesting things to people visiting it, with grand staircases leading to the iconic stone facades and carvings, with a great panoramic view of the city. The motifs on the facades are various, starting from biblical images, nautical ships, together with some Chinese characters and Japanese flowers. In general, you can get the impression that the whole world merges at one place, where regional and local influences are quite obvious. Unfortunately, due to the circumstances, no original works of the college could be preserved, except one – a 17th-century painting of St. Michael Archangel. Next to the Ruins of St. Paul’s, on its east side, are Mount Fortress (大炮台; Fortaleza do Monte) and Macau Museum (Museu de Macau). Mount Fortress, the former military center of Macau, built initially in 1617 is one of the places that offer a breathtaking view of the city. In the half of the 20th century, it was converted into a weather observatory, while it became a museum by the end of it. You can enjoy the nature surrounding it, exploring the fortress and the cannons, which speak louder than words about the rich history of the city. The easiest way to understand the history of the former Portuguese colony of Macau is to visit Macau Museum (澳門博物館; www.macaumuseum.gov.mo; 10:00-18:00, closed on Mondays; adults/children MOP$15/ MOP$8), established inside the old fortress in 1990. On the opposite of most museums, where usually only one specific theme is presented, there are various things that can be seen here, paying attention to the differences in nationalities, cultures, and traditions that were typical for this city throughout the history. The three-story building offers various exhibitions, starting from the presentations of the origins of the region on the first floor, while the second floor is reserved for the exhibition of different cultures and traditions. On the third floor, you can get more information on modern life in Macau, and the opportunities that you can have and things that you can see while being in the city. Behind the Ruins of St. Paul’s are small traditional Chinese temple Na Tcha Temple (Templo Na Tcha) and the Section of the Old City Walls (舊城牆). The gray building of the traditional Na Tcha Temple (大三巴哪吒廟; 8:00-17:00; free), built in the traditional yingshan style in 1888 is an example of typical Chinese architecture and one of the youngest temples in Macau. It is dedicated to a local god of war, Na Tcha, and the illustrations on the walls inside can provide a great story about the background of the temple. Its location makes it convenient for visiting, even though there is not much to be seen or appreciated in this very simple building. While here, you can also see the remains of the city walls, dating from the period of the 16th and 17th century when Macau was still a Portuguese colony. The Section of the Old City Walls is 18.5 m long, and its construction is unique and quite interesting, consisting of rocks, clay, sediments, shells, and rice. Guia Fort and Lighthouse (Fortaleza da Guia) is about 20 minutes by foot away from Ruins of St. Paul’s. If you are feeling strong enough, it is worth an effort to go there. Head north of Ruins of St. Paul’s along Calcada de São Paulo and then turn right onto R. de Dom Belchior Carneiro. Walk along Rua de Dom Belchior Carneiro, Rua de Tomas Vieira, Estrada do Cemiterio, Rua Filipe O’Costa, Calcada da Vitoria and Estrada do Engenheiro Trigo, and you will be at the Guia Fortress and Lighthouse (東望洋炮台; 9:00-17:30; free). This is a former military complex, consisting of a fortress, chapel, and a lighthouse, dating from the 17th century. It also offers a great view of Macao and serves as a place where you can enjoy the nature and history. There is a chapel inside the fortress, with different religious and mythological motifs, again depicting the multicultural side of Macau. The lighthouse stands as a symbol and reminder of the maritime and military past of the city. After visiting all these places, if there is still energy left in you, not far from Guia Fort is a beautiful Lou Lim Iok Garden (盧廉若公園; Jardim de Lou Lim Ioc; 6:00-21:00; free), where you can relax. This very rich, yet very peaceful garden serves as a certain reality escape, or just as a perfect place to spend your spare time. The only Suzhou garden in Macau, however, wasn’t always a public place, but it was a private property until the other half of the 20th century. Besides the lake, flowers, rock sculptures and decorated fences, you can enjoy the frequent sounds of music that come from the people around.